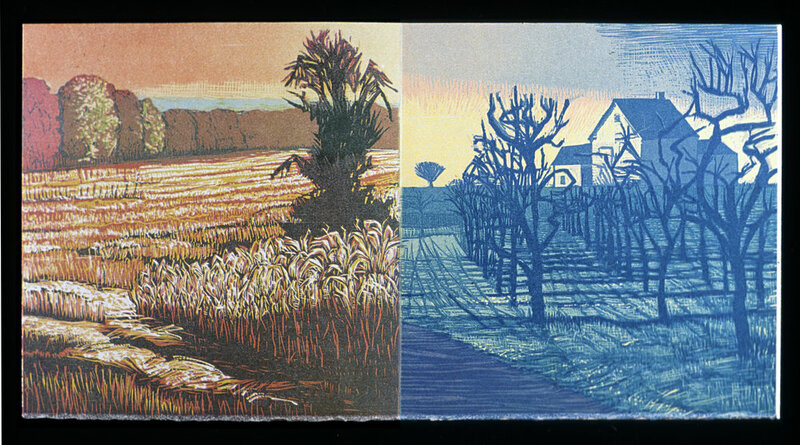 Lonesome Rows is an accordion-fold, two-sided wordless woodcut book about the apple groves and fields in South Glastonbury, CT. The panoramic rows of bare fruit trees receding into the distance create a haunting rhythm of disjointed panels. The back side has an abstract echo of the images on the front. Made from three long birch blocks developed in the reduction technique and printed in countless runs on the Duffa flat-bed offset press, The paper is Somerset Velvet Tan mounted inside hard covers wrapped in Somerset Book. It comes housed in a printed, paper slip-case and measures 10x10” closed and opens to 6ft. 4 inches. Lonesome Rows was issued in an edition of just 30 copies. 1999.